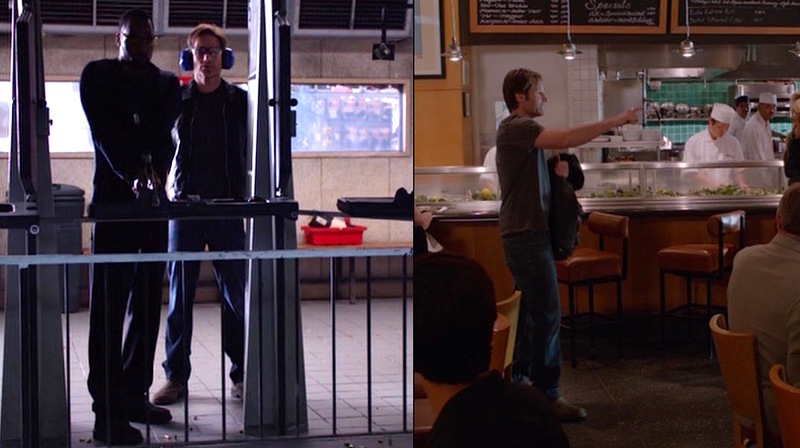 David Duchovny as Hank Moody in “The Ride-Along”, Episode 5.05 of Californication, with a Desert Eagle-wielding RZA. Two years before Ice Cube and Kevin Hart took their seats in a police car, Hank Moody joined unstable rapper Samurai Apocalypse (RZA) for an Santa Monica PD ride-along to prep for Sam’s new movie, Santa Monica Cop. 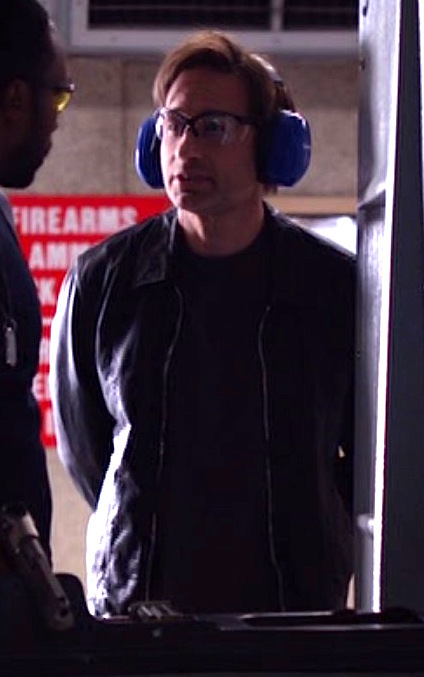 Writing a movie called Santa Monica Cop (no, it’s not supposed to be a very original concept) is an unexpected scenario for Californication‘s cynical, hard-drinking protagonist, but even more unexpected is the setting for the episode’s cold open: an L.A. gun range. 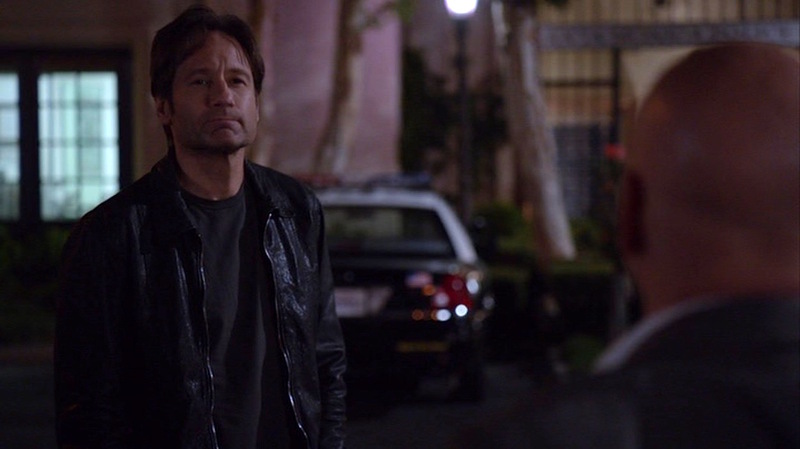 Hank’s black leather jacket is the same cool Dolce & Gabbana jacket that Duchovny first wore in the fifth season premiere “JFK to LAX” (Episode 5.01). Given that he likely lost most of his clothes when his apartment was set on fire in that episode, it makes sense that he would stick with the same one through most of this season. The soft lambskin jacket has a silver zip front with a shirt-style collar, slanted hand pockets, and silver-toned snaps on each cuff. The back is stitch-divided into three panels. Hank evaluates Charlie as a law enforcement partner. Since Dolce & Gabbana isn’t exactly a cheap brand, Moody aficionados can explore a replica of the jacket sold on Amazon, marketed by JJacket as the “Hank Moody Leather Jacket” and currently retailing for $135 (as of January 2016). Hank’s dark gray cotton t-shirt would be a much simpler item to track down. Like all of his t-shirts, it has a crew neck and short sleeves, and it’s likely James Perse – still available as the “carbon pigment” jersey t-shirt at Nordstrom. Hank never deviates from his denim bootcut jeans, and a day at the range followed by a night in a cop car would be no reason to change. His jeans in “The Ride-Along” are a dark blue wash with the usual five-pocket layout and unused belt loops. Hank hikes up his jeans during an intense night out with Charlie and Sam. Throughout the fifth season, Hank’s go-to footwear are his tan suede Chelsea boots with black elastic side gussets, likely the Timberland “Torrance” model that he’d worn steadily since the first episode. Although the Torrance has been discontinued, some examples always show up on retailers like eBay, and Amazon also carries the latest generation of Timberland Chelsea boots: the Chestnut Ridge in dark brown oiled leather. Hank goes from one kind of crazy to the next: from the violently paranoid Samurai Apocalypse to the unstable immodesty of literary rival Richard Bates (Jason Beghe). If Hank were doing any shooting, the silver double-ridged ring on his trigger finger might have gotten in the way of his accuracy, but he leaves the actual gunplay to Sam. He also wears his usual black leather bracelets – one studded with snaps and the other braided and tied – on his left wrist. UrbanWrist sells fine reproductions of Hank’s bracelets in a $40 bundle pack. Officer Moody reports for duty. 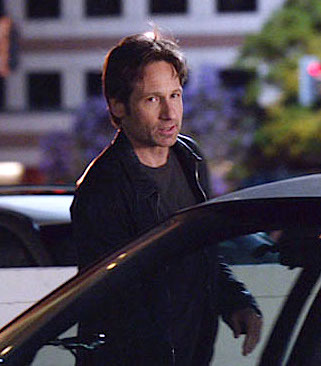 Hank Moody’s outfit in “The Ride-Along” (Episode 5.05) serves as a prototype for his base look in the show’s later seasons – a black leather jacket, gray t-shirt (rather than his usual black or blue from earlier seasons), dark jeans, and brown Chelsea boots. Samurai Apocalypse (RZA) chooses an IMI Desert Eagle Mark XIX as his character’s sidearm in Santa Monica Cop, and thus his day at the range with Hank Moody finds him firing a brushed chrome model. As a Californian, Sam may be using a DE44CA, the only Model XIX approved for dealer sales to the public in the state. Chambered for .44 Magnum as its name implies, the DE44CA differs from standard Mark XIX models with a firing-pin block incorporated in its design. Sam admires his Desert Eagle. The Desert Eagle has attained iconic status over the decades for its use as a powerful and flashy manstopper in movies and video games. The first model, Mark I, appeared on the market in 1983, chambered for the .357 Magnum which is typically only found in revolvers. Additional variants over the years meant more available calibers (.44 Magnum and the formidable .50 Action Express are still available; .41 Magnum and .440 Cor-Bon have been discontinued), and the most recent model – Mark XIX – was introduced in 1995 with the ability to change calibers by swapping out barrels. Check out the whole series. My favorites are the first and second seasons, but you’ll have to visit the fifth season to find this episode! And do yourself the favor of always wearing proper eye and ear protection when you go shooting! 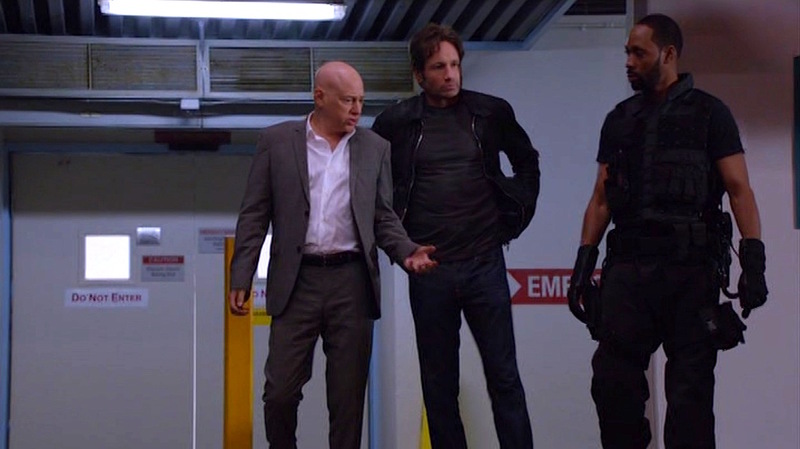 So what’s the move here: good cop, bad cop, bald cop? 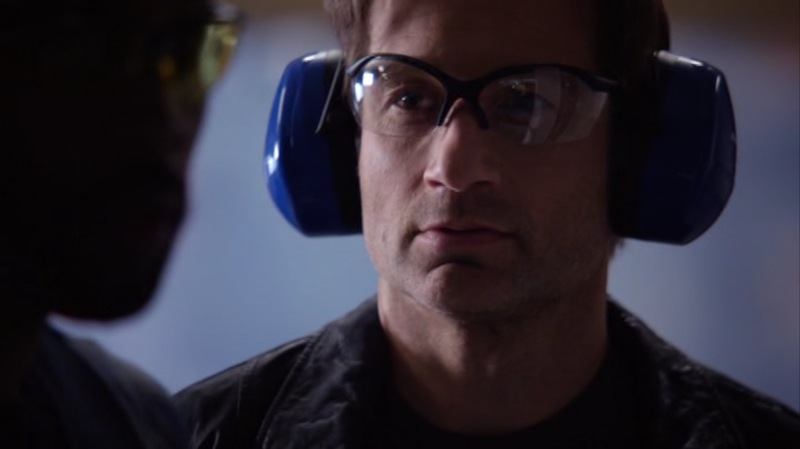 Hello, question: Do you by chance know the brand and model of the sunglasses Hank is wearing in this episode? It seems David either used his personal pair or liked them enough to wear offscreen. They seem to be some shade of purple lenses. Thanks in advance. I thought I read somewhere (or saw on an auction page) that these are Ray-Bans, but I’ll need to confirm that and find my source! 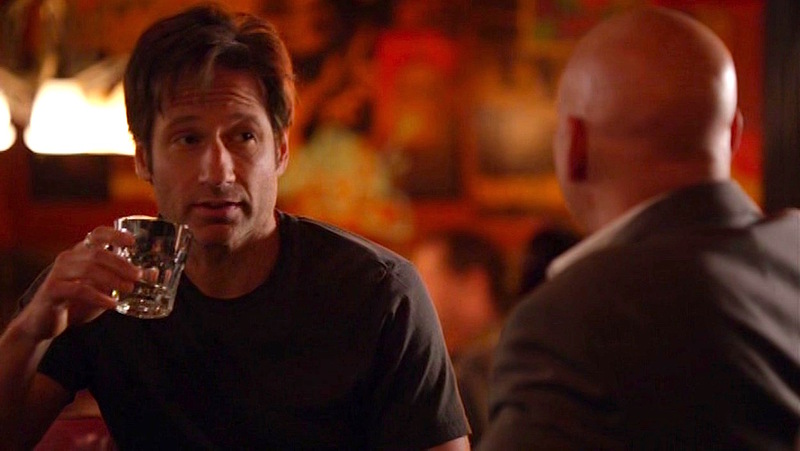 Sometimes Duchovny’s personal pairs (like the thick-framed Oliver Peoples specs in season 3) seemed to make their way onto the screen. His personal sneakers definitely did!